Lucas Frye (Tom Conti) is a charming, floppy haired MI5 spy living the difficult life of being a double agent for the Russians and betraying his homeland. Given the beautiful Russian women he gets to laze the day away with it's not much of a surprise. 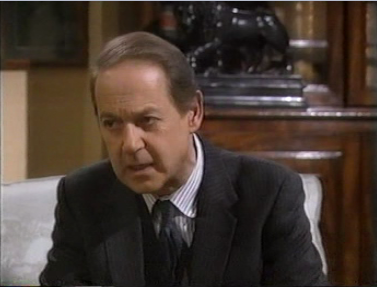 However, hot on his treacherous tail is MI6 agent/desk jockey Peter Duckham (John Standing) who is hellbent on exposing Frye's slippery loyalties. He's gathered enough information to hang Frye out to dry, but Duckham's boss, Sir Roland White (Robert Lang) is anxious to avoid another spy scandal. Much to Duckham's disgust, Frye is merely banished to Moscow and the whole affair hushed up. Fast forward a few years and Frye is back in the UK. He's planning to setup a freelance espionage agency and Sir Roland White is highly dubious about Frye's motives and loyalties. 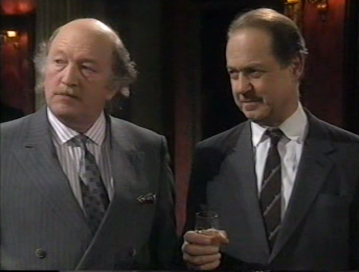 Duckham - by now ex MI6 - is asked by Sir Roland White to keep an eye on Frye. Duckham meets with Frye and is implausibly invited to join Frye's firm - FDA (Frye Duckham Associates - Frye's already got the stationary sorted!). Duckham bites his hand off as it proves his chance to finally nail Frye. Helping the pair is the equally enigmatic Parker Morrow (Jayne Brook) - an ex CIA agent willing to work with FDA on certain assignments. At the heart of the show the three agents seek to hoodwink each other in order to achieve their own personal goals. This is all set against a backdrop of missions involving spying on computer whizzkids, dodgy sports agents and even plots against Frye's life. Ever heard of Clement and La Frenais? Of course you have! 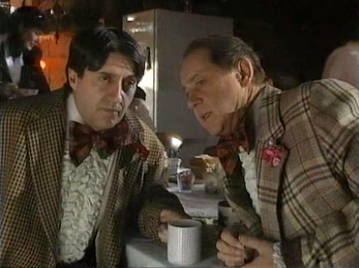 They're the geniuses behind classic Britcoms such as The Likely Lads, Porridge and Auf Wiedersehen; they also happen to be the writers behind Old Boy Network. 7 episodes were produced (we do love a 7 episode run, the 7th episode always feels like a bonus) and transmitted on ITV in 1992. A VHS of the series was released in the 1990s, but it has failed to make the leap to DVD and only a few fragments of the show can be found online. 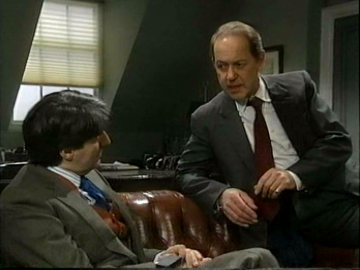 We were busy trawling through a long list of rare British comedy DVDs when we stumbled across Old Boy Network. 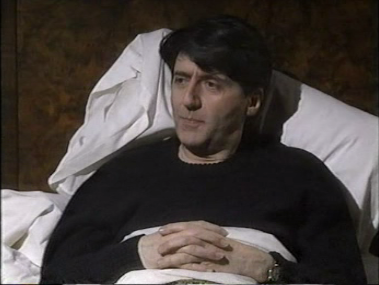 It sounded ridiculously British, so we delved a little deeper; it starred Tom Conti who we had heard a lot about, but never actually seen him in anything. Our curiosity was running rampant at this point, so we just had to buy that pirate DVD and devour it. It's a Clement and La Frenais piece, so as you can imagine we're treated to some amazing dialogue. It's packed full of quick wit and clever characters which is expertly measured to make sure scenes never drag and totally immerse you. Then there's the acting. 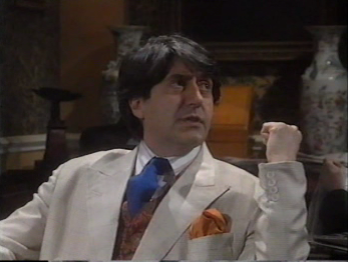 Tom Conti - WOW! He's absolutely fantastic and it's not often that a 90s sitcom would manage to get hold of someone previously nominated for a Best Actor Oscar. Conti is on magnificent form here and appears to be having the time of his life by affecting disguises, drinking cocktails and flirting with a string of glamourous women. 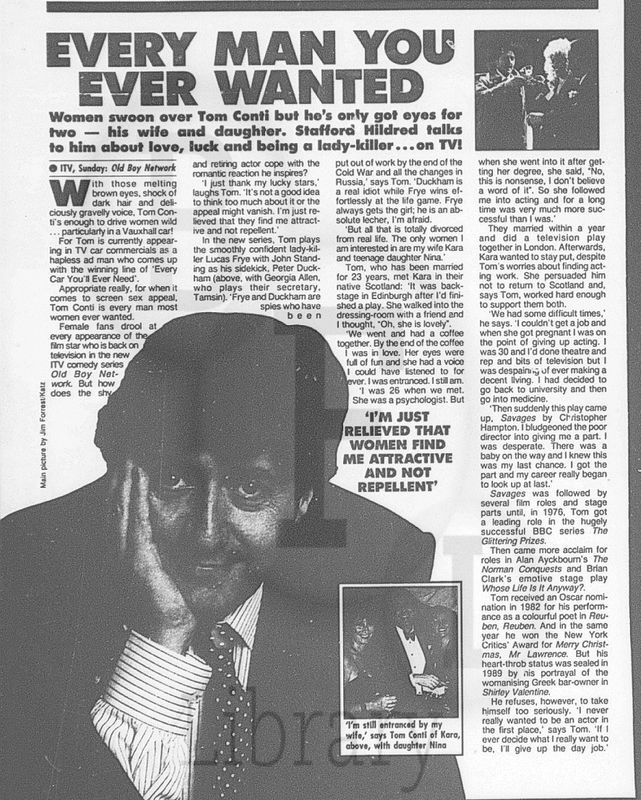 And, of course, John Standing is an excellent choice to contrast Conti. 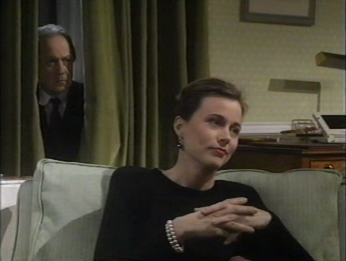 Standing's world weary stare completely sums up Duckham's frustration at Frye's constant ability to get away with it all. Together they make a wonderful double act that work tremendously well together. Jayne Brook as Parker Morrow brings that confident charm that Americans do so well and it's all accompanied by her wonderful beauty. She's an interesting addition to Duckham and Frye as she proves to be an object of desire that neither can achieve. We really loved the dynamics between Frye, Duckham and Morrow as their bickering and subterfuge provides a delicious thrust to the plot which keeps you guessing. It's a shame that this isn't fully realised, though, as we think this is the most interesting aspect of the show. In fact, we would go as far as to say it often overshadows each episode's plot. Too often the plots seem rather menial and inconsequential compared to the three agents' relationship. The episodes without Parker Morrow also suffer from her absence and lack a certain zing. Are their laughs? Yes! As we said, it's by Clement and La Frenais, so there has to be laughs. They're all clever and the actors' talents make sure they're delivered with the full impact they deserve. We think that Old Boy Network definitely deserved a second series to explore the characters a bit more and refine the plot flaws present. The Piglet Files had just finished its final series, so there was definitely an outlet for a spy sitcom, but sadly it was never to be. Hopefully Network will release this in the future as it's far more deserving than many DVDs they've chucked out over the years. In the mean time if you search hard enough you should be able to find bootleg copies available online to enjoy the superb performances.